I spotted this beautiful bird on my feeder this week. He is finch-sized and a little raggedy in appearance; he is probably molting. 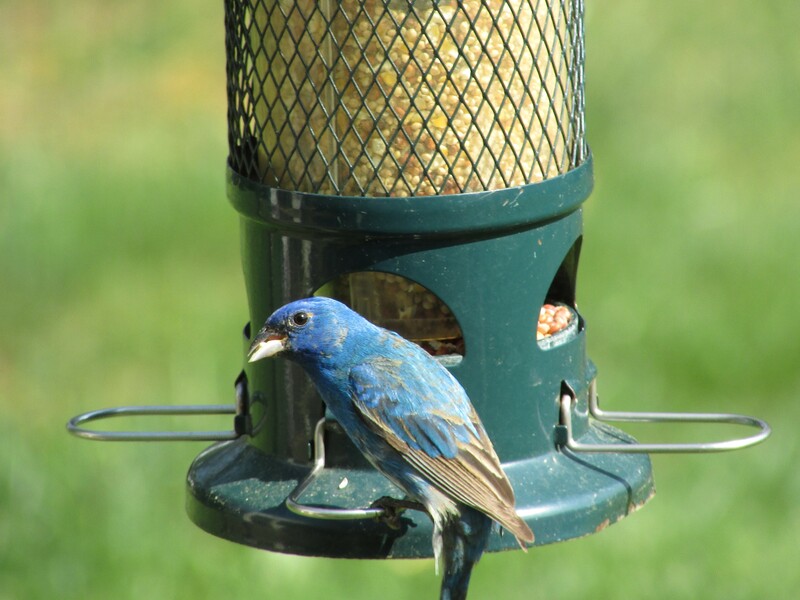 I think he might be a Blue Grosbeak, a bird we don’t see much in southern New Jersey. Can anyone positively identify him for me? Thanks! One of my ‘Places in the World‘ is walking with eyes up, camera in hand, searching out birds in interesting poses to photograph. He’s a beautiful bird, but I don’t know his name. I think I might have the name…but this type of bird doesn’t visit here often so I’m not 100% sure. I do not have a clue but it is a pretty bird and has a big beak for a little bird. It does have a big beak. I noticed that too. We’ve never seen one like it on our feeder. I thought it was a bluebird at first, but when I looked up bluebirds saw it was not that species. What a cool visitor to your garden. Great pic.